We’d love your help. Let us know what’s wrong with this preview of It Began With a Lie by Michele Pariza Wacek. But instead of a new beginning, Becca is thrust into a mysterious past she barely remembers, as she is now living in her aunt's house (or what the locals call "The Witch House"). To ask other readers questions about It Began With a Lie, please sign up. Am I okay? I considered the question. I had a knife in my purse. I was afraid my stepdaughter, and maybe myself, were being possessed by ghosts. And I had just been momentarily convinced that a harmless homeless woman would have all the answers. Was she really a monster? Or was she right— that I didn't know who to trust? After all, my first husband cheated on me, and my second husband was trying to get me committed. Clearly, I wasn't such a great judge of character. It Began With a Lie is a difficult book to pigeonhole, so I stopped trying. While billed as a romance, this book has very little romance in it. It's part paranormal mystery, suspense, women's fiction, crime story, all with a tiny bit of romance mixed in. But despite the mashed genres, it's a good story. Becca returns to the town of Redemption to make a clean start with her husband and stepdaughter. Her husband's job is in shambles, and so is the house they own, Becca's deceased aunt's home. Add It Began With a Lie is a difficult book to pigeonhole, so I stopped trying. While billed as a romance, this book has very little romance in it. It's part paranormal mystery, suspense, women's fiction, crime story, all with a tiny bit of romance mixed in. But despite the mashed genres, it's a good story. Becca returns to the town of Redemption to make a clean start with her husband and stepdaughter. Her husband's job is in shambles, and so is the house they own, Becca's deceased aunt's home. Add in the fact that her aunt was probably a witch, the house is haunted, and there's an unsolved mystery from her youth that Becca has no memory of, and you've got a twisted tale that keeps you guessing. While I guessed early on what the solution to the mystery is, most will not as the clues are subtle and easy to miss. The writing is good, but there were some reptitive issues with events that can bog it down for a bit. These are few and could be attributed to the fact that I read an ARC copy, not the finished product. The book is also technically a serial, but the end is written to allow it to stand alone, giving us unanswered questions but not just stopping dead until the next book. The mystery story is the big plot in the book, but there is a sequel coming out in November 2018 that will continue Becca's story and the mysteries of Redemption. ***Tangled Hearts Book Reviews received an ARC copy of this book in return for an honest review. crumbling marriage back on track and become closer with her 16 year old difficult step-daughter? Or will she turn to her old crush? Well written and well crafted story. It is written in first person, which I don't particularly enjoy, but once you get started reading it fades away and you get engrossed into the story. A unique, and unpredictable read with twists and turned. There are complications and what some call a haunting. A satisfying read! "I voluntarily received a complimentary copy, however, these are my honest opinions. I was in no way required nor compensated to write a review." This book was not what I expected, even as I was reading it! About 25% into it, I was annoyed and had wrote a three paragraph review because I was so annoyed with Rebecca but I kept thinking there was something more ahead, and WHOA, there was. I was annoyed because Rebecca was spineless and weak when it came to her husband and step-daughter. And I just didn’t understand why she went along with his crazy plan. They live in NY but due to financial issues at her husband’s law firm they lose their apartment and he’s about to lose his business. He decides the family is going to move to Wisconsin and live in a home Rebecca inherited from her aunt. They would get it ready to put on the market and live there to save money. A home tied to some dark secrets that Rebecca doesn’t even remember. Doesn’t sound too crazy, right? Except he’s going to continue to work in NY and he’ll come to Wisconsin every now and then. Um, hello? How is this cost savings? How does this make sense? And Rebecca just goes along with it to try and save her marriage. Listen lady, if after 10 months of marriage this horsesh*t is happening, you may want to reconsider working to save your marriage! Seriously, I was done with Rebecca at this point. Not even her family could talk to her about the craziness of this decision. Her mom expressed my feelings exactly regarding this nonsense! Living in a home that holds secrets, and living with a step-daughter that hates her is difficult. Also, she’s getting memories and flashbacks from the summer that had remained a blank to her, other than knowing she almost lost her life. She’s getting reacquainted with her friends from that time and they’re sharing information to help her remember that time in her life. Other than those friends, nothing else is going well and she continues to spiral down. I went from hating this book to loving it! The parts of the storyline that made no sense to me all had a purpose and once it all came together, it was a slap to my forehead. Brilliantly done on the author’s part! There are twists and turns in this story and many different mysteries, only you won’t be sure they’re actually mysteries or not. I had a lot of suspicions and then there’s a moment in the book that I KNEW exactly what was happening. I had suspected some of it, but I thought I knew it. And then, I found out I only knew some of it, boy was there more! If you enjoy psychological thrillers, romantic suspense or paranormal elements you NEED to read this book. Actually, if you think you don’t enjoy those tropes, you still need to read this book. I am not a fan and do not typically read paranormal books. And, it’s not that I didn’t roll my eyes or think it was ridiculous in this book when it happened, because that’s just me but, it absolutely added to this book and it wouldn’t be the same with those parts taken out. There’s a second book coming out in November and I can’t wait to read it! It looks like that book will be dealing with the mystery that still remains at the end of this book. I can’t wait to see what the author comes up with next! But, grab this book now! It Began With A Lie is not my usual read but I found it extremely difficult to put down. This is this author's debut full length novel. There is a novella which was published prior to this book. Once I got started I wanted to know what would happen next. Were there truly ghosts involved or was the entire thing brought on by bad meds? Was Chrissy really a bad teenager or was everything she did brought on by bad parenting? Almost from the start I wanted Becca to leave her jerk of a husband and Daniel to rekindle their lost love. You don't always get what you wish for in the books you read though. This book has so many twists and turns and such a convoluted storyline you will not want to put it aside. I gave this book 4 of 5 stars for plot and character development. The plot is interesting with a dash of the supernatural/paranormal and only a hint of romance. There is truly nothing sensual in nature about this story but the goings on will keep you on the edge of your seat. Is Becca's aunts house really haunted? Or is there something far more sinister out to destroy them all? There are so many questions that are answered and an equal number of them left unanswered. The only let down I had was the more or less cliff hanger ending. You'll have to delve into the next book to find out what happens next. This is Book 1 of the Secrets of Redemption Series. You won't want to miss Book #2 “This Happened to Jessica,” coming Nov 2018 to solve any cliff hanger issues you may have. I received a complimentary digital ARC of this book to read from the publisher. This in no way affected my opinion of this book which I read and reviewed voluntarily. It Began With a Lie a psychological thriller by Michele PW that you don’t want to miss. Years ago, something bad happened in her Aunt Charlie house that left one teen missing and Rebecca unable to remember that summer night. Now fifteen years later, Rebecca "Becca" is back. With the death of her Aunt Charlie, who left the house to Rebecca. But, Rebecca doesn’t feel comfortable about staying in the house, which is known in the community of Redemption, Wisconsin, as being haunted. But with nowhere It Began With a Lie a psychological thriller by Michele PW that you don’t want to miss. Years ago, something bad happened in her Aunt Charlie house that left one teen missing and Rebecca unable to remember that summer night. Now fifteen years later, Rebecca "Becca" is back. With the death of her Aunt Charlie, who left the house to Rebecca. But, Rebecca doesn’t feel comfortable about staying in the house, which is known in the community of Redemption, Wisconsin, as being haunted. But with nowhere left to go, Rebecca only option was to stay in the house. When night falls the house starts to awaken, and strange things begin to happen. Is Rebecca finally started to crack up or is there something sinister about the house. It was by accident that I signed up to read this book. However, after reading this gem of a book, I am glad that I did. I have said it before I don’t like first person narrative storylines. But, again there are some authors that spin a great tale that the story just pulls you in, and by then you don’t mind what narration the story is being told in. It Began With A Lie is a psychological thriller involving a woman, Becca, who is forced to move back to her Aunt Charlie's home due to financial circumstances. The problem is that in this house, something terrible happened. At least she thinks it did, but she can't really say. The problem is that once she's back in the home she hadn't set foot in for a couple decades, she starts having strange feelings and visions she can't explain. 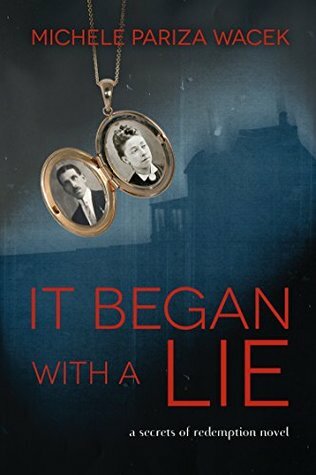 The story itself was okay but because it was written in first pe It Began With A Lie is a psychological thriller involving a woman, Becca, who is forced to move back to her Aunt Charlie's home due to financial circumstances. The problem is that in this house, something terrible happened. At least she thinks it did, but she can't really say. The problem is that once she's back in the home she hadn't set foot in for a couple decades, she starts having strange feelings and visions she can't explain. The story itself was okay but because it was written in first person, I couldn't get as into it as I would have liked, particularly her thoughts on her snarky stepdaughter who was horrible. I admit that it did take away from my enjoyment of the story, which I concede was thrilling, interesting and kind of crazy! This book was not my usual genre, but it was sure exciting! I don’t like scary, ghostly, haunted storylines because they give me nightmares. I had to put this book down a few times because I was getting creeped out! Rebecca and her husband Stefan and his daughter Chrissy are going back to Rebecca’s hometown of Redemption to deal with the house that was left to her. Unfortunately 15 years ago something terrible happened in the house and going back is the last thing she want to do. There was so mu This book was not my usual genre, but it was sure exciting! I don’t like scary, ghostly, haunted storylines because they give me nightmares. I had to put this book down a few times because I was getting creeped out! There was so much tension and weirdness going on and Rebecca/Becca just seemed to want to avoid getting any answers. Her stepdaughter was so mean to her and her husband was acting so suspiciously. I was annoyed how much she just put up with. The justifications she came up with were somewhat weak. The one person who really wanted to help was Daniel the cop and she kept avoiding him. I couldn't put it down!!! Loved the characters, the setting, the backstory...well all of it!!! Kept you guessing and looking around every corner. It's been quite a while since I read a book that held my interest as much as this one did. I am purchasing the 2nd book right away!!! If you like interesting characters, an intriguing plot, and not being able to put "the book down" til you reach the end....well, this one is for you!!! I liked this book - finding one's strength, one's voice, while everyone thinks you're crazy. why would anyone think you were crazy? ghosts? memory loss? or something more sinister? this is a definite read!! I received this ebook in a Goodreads giveaway. This was a new author for me, overall the book was very good. Lots of twists and turns and left me guessing until almost the end about the outcome of the book. I would certainly recommend it to others. I have always been drawn to this genre of writing and this book makes me definitely remember why that it way. Kept me guessing but was also relatable which is a difficult thing to do in my opinion with these books . I really loved this book. The author has a way of making you feel the main characters feelings and pain. I won't forget this book. Her main character is amazing. The story left me feeling sad and shocked. An interesting story for sure! Great book can hardly wait for the next one ! Only had part is know 2019 before the third book! This story was scary, a little funny but l loved how it kept me guessing till the end. Read this you won't regret it. Found this author in a promotional. The writing crisp, clear, and easy to follow. Well developed plot line, and characters i loved. A good mystery. Will be reading more. “It Begin With A Lie” is the first book in a new series, Secrets of Redemption, by Michele Pariza Wacek (Michele PW). This book had me hooked from the first moment that I read the description. Why? I really can’t answer that because I don’t know. I don’t watch movies, or read books for that matter, with ghosts, scary dolls, ridiculous clowns, or mask wearing men. The whole paranormal thing, even though I live in “Mystic Falls”, is not my thing. I’ve tried and often lose interest because I’m yell “It Begin With A Lie” is the first book in a new series, Secrets of Redemption, by Michele Pariza Wacek (Michele PW). This book had me hooked from the first moment that I read the description. Why? I really can’t answer that because I don’t know. I don’t watch movies, or read books for that matter, with ghosts, scary dolls, ridiculous clowns, or mask wearing men. The whole paranormal thing, even though I live in “Mystic Falls”, is not my thing. I’ve tried and often lose interest because I’m yelling at the characters that have no common sense not to mention I’m wetting my pants because something unexpectedly jumped out. Give me break. I’m over 40 and…these things happen. Move on. Rebecca is one of the most complex characters that I’ve encountered in a long time. It was interesting to watch her character develop from a weak, scared wife to a strong woman escaping the mental ward and confronting her husband. Stefan is a gorgeous, successful lawyer whom I hated from the first “sorry babe, gotta take this.” I have a love-hate relationship with the 16 year-old Chrissy and really hope to see more of her in the next book. I would not call this book a romance but there sparks between Rebecca and Daniel, a teenage crush and local police officer. The book does not end in a cliff-hanger per se but it does leave you with enough unanswered questions that you will definitely want to read the next book which I hear is expected to release in November. You better believe that I will be reading it. What is my rating? 5 out of 5 propellers!!! Because I didn't have an awful time. And I'm a fan of untrustworthy MC. It began with a lie is a little twisted story trying to be so many different things at once and it never quite reaches any of them. It lacks as a mystery thriller. It fails completely as a ghost story. It couldn't even do the buddy cop solve a mystery thing right. Ugh. The only thing it did right was keep me guessing. Because oh boy I had no idea where it was going. And maybe neither did the author? It was very weirdly structured. Also the whole mystery solved in one paragraph. And it was allergy medicine. No, I'm not kidding. I found this series when I got a free copy of the prequel novella, “The Secret Diary of Helen Blackstone”. After reading the novella, I immediately grabbed this book and could NOT put it down. I was up til 1:30am finishing it. (Even though I had to be at work at 7:30am.) I’m starting the next book as soon as I get out of work!!! This is not the genre of books I typically read, but it sucked me in right from the beginning. After inheriting her Aunt Charlie’s home, Becca (along with her husband and I found this series when I got a free copy of the prequel novella, “The Secret Diary of Helen Blackstone”. After inheriting her Aunt Charlie’s home, Becca (along with her husband and teenage step-daughter) is returning to a place she spent her childhood summers and she is terrified! Something bad happened to her there when she was 16 but it was so horrifying that she blocked it out. And it seems someone there is after her. Is it because of what she can’t remember? Or is something else going on? Definitely recommend reading this book. house inherited by her from her aunt. Stefan continues to work in the city, and visits once or twice a month. Rebecca tries to develop a friendly relationship with her difficult stepdaughter Chrissy. Suddenly, there is a series of strange events affecting both Rebecca and Chrissy. After I bought it, I was disappointed to see it had some supernatural elements to it. Decided to read it anyway and I loved it. It was really a good book that kept me guessing the whole time. The story is complete in itself, but there is an unsolved mystery from the past. It seems that will be settled in the next book. I am just going by the name of the second book, but I will certainly be reading that. Thank you to Michele Pariza Wacek and Goodreads.com I won this book in a Giveaway. Fast paced creepy thriller that left me on the edge of my seat, couldn't put it down and stole every second to find out what was happening to this family ! I was disappointed with the reason why at the end, I felt that the way this story was weaved it would have been something else entirely not so cliche. Loved the pace, loved the characters and it was a great read ! I never could figure out what was going on in this book. Nothing made sense. I don't like paranormal and probably never should have read the book. But I 've read other books with ghosts but it nothing as weird as this book. I do not recommend it until you are heavily into it. I did not like the main character. She was an airhead & the story line was far to easy to figure out what was happening. There are 2 more books following this one. I read the readers reviews and evidently her character doesn’t change. Not interested & I’d advise not to waste your time. This book was hard to put down! I would get upset with the main character doubting herself, but I guess it was hard for her to trust herself. The way the plot was set up was so gripping, it had me entranced til the end. I can’t wait to find out what happened to Jessica! The ending was satisfactory.